The Kavia Elite is the top model in the Kavia Series. Featuring high quality thrust bands, leather pouch, and built-in BB magazine for rapid reloading. 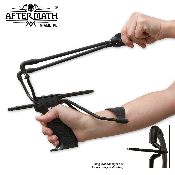 An adjustable wrist brace and the integrated and adjustable sight will assist you in hitting your target time after time. Includes a set of 30-count 3/8" BBs.